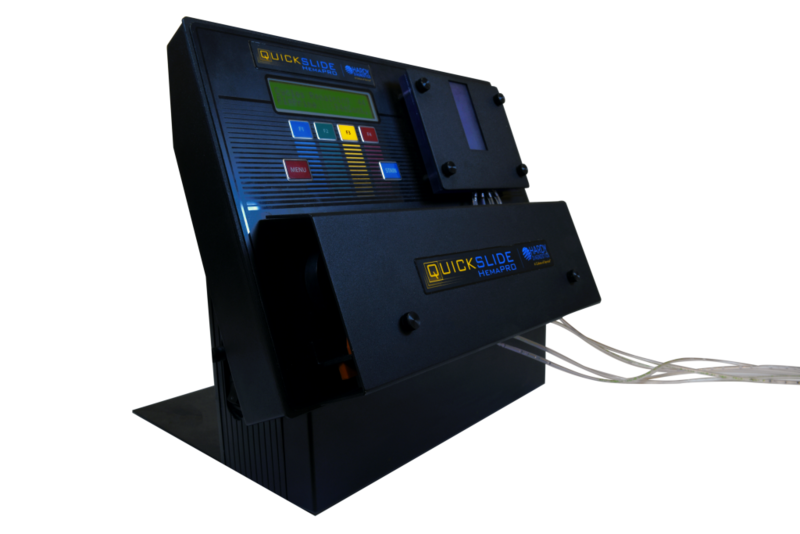 Consistent Wrights-Giemsa Staining in as Little as 90 seconds! 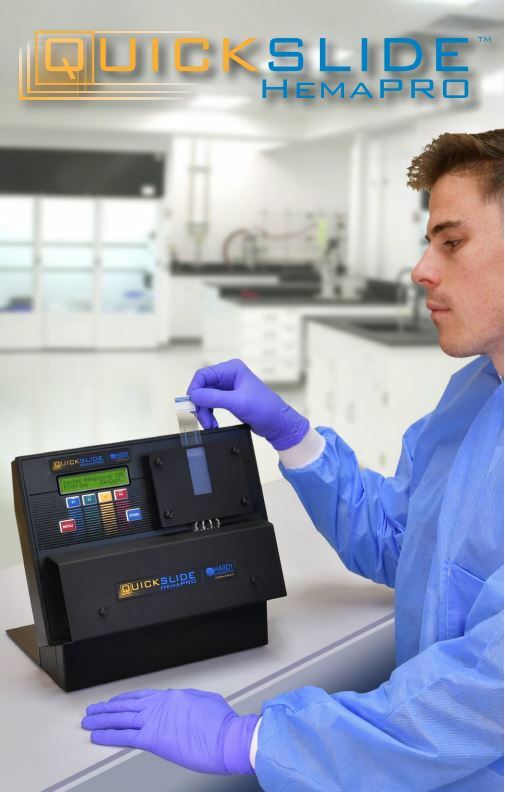 The HemaPRO™ Slide Stainer is a valuable addition for any hematology laboratory, especially those pursuing automation and standardization. The HemaPRO™ utilizes an advanced cuvette, providing consistent results with precise reagent delivery to specimens. The HemaPRO™ is equipped with customizable stain settings to obtain the preferred color intensity for both peripheral blood and bone marrow specimens. No need to monitor remaining reagents as the HemaPRO will notify the user once depleted. Including the reagents and unit, its small and compact size requires only one square foot of counter space! What about the maintenance? The HemaPRO™ is one of the most durable stainers on the market, requiring very little maintenance. No daily maintenance is required! Maintain your unit in less than 15 minutes every six months with a simple tubing change. Spend less time cleaning and more time on more important tasks! Select the setting, load the slide, and walk away! Self-contained Wrights-Giemsa staining reagent kit for the HemaPRO includes the three Wrights-Giemsa stain reagents in 500ml bottles that fit nicely on the HemaPRO reagent platform. Perforated box top allows easy access to insert reagent tubing. Includes the reagent module needed to operate HemaPRO. 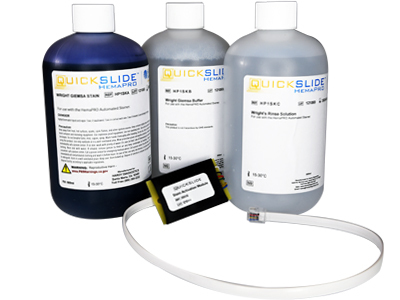 Each kit will stain 125 slides. 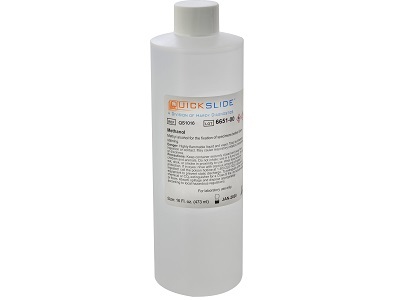 For use with the QuickSlide™ HemaPRO Hematology Stainer. A tubing change is recommended at least once annually. 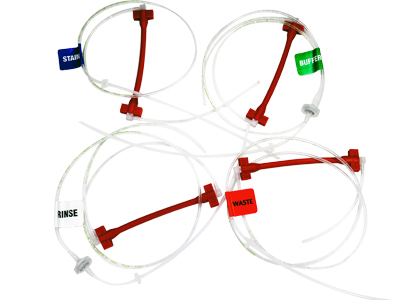 The kit consists of labeled tubing, (4) Orange pump tubes, reagent cannulas, check valves, tubing elbows and the wire ties to secure the tubing to the unit. Tubing can be installed in just a few minutes. Guaranteed non-sticking, ideally suited for hematology differential smears, pathology tissue mounting and all general microscopy. 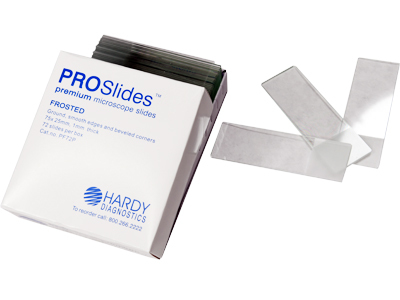 Slides are manufactured from highest purity, corrosion-resistant clear sheet glass fully annealed to minimize chipping. Edges are precision ground for smoothness. A first quality premium slide. One side is frosted for easy labeling. Methanol (methyl alcohol) specimen fixation is far better than heat fixation. The specimen will adhere to the slide better and will not cause distortion of the cells. Heat fixation can lead to sloughing off of the specimen resulting in clogging of the lines and cross-contamination. Everything is working well with the Staph plates and we like these plates better than any others that we have worked with.